I serve as Unit Leader of the Wisconsin Cooperative Fishery Research Unit. I earned my degrees from Southern Illinois University (BS), Tennessee Tech University (MS), and South Dakota State University (PhD). 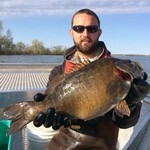 Before my employment with USGS, I was an assistant professor of fisheries at the University of Wisconsin-Stevens Point and worked as a fisheries biologist and research scientist with the Ohio Division of Wildlife and the Minnesota DNR. I earned my B.S. in marine biology from the University of California, Santa Cruz, and my PhD in fisheries from the University of Washington. I am interested in fisheries genetics. 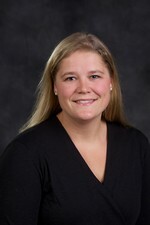 I am a research scientist in the Larson Lab studying the genetics of inland and Great Lakes Cisco. My previous research focused on genetic patterns in Southeast Asian fisheries. I am a Research Scientist with the Wisconsin Cooperative Fishery Research Unit and serve as co-director of the Fisheries Analysis Center. 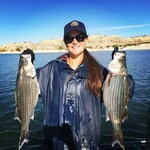 I’ve earned degrees from Carthage College (B.A., 2009), Mississippi State University (M.S., 2011) studying factors that structure fish assemblages in floodplain lakes, and South Dakota State University (Ph.D., 2014) studying yellow perch recruitment and interactions between yellow perch and smallmouth bass. I am the Laboratory Manager for the Aquatic Biomonitoring Laboratory. My primary professional interests are stream ecology and aquatic macroinvertebrates. I’m a total Wisconsin product and performed my undergraduate work at the University of Wisconsin – Stevens Point. In my spare time I’m involved with youth development, fishing and hunting. I am a Research Scientist with the WI Cooperative Fishery Research Unit evaluating biological factors influencing Walleye recruitment in northern Wisconsin lakes. Previously, I have studied abiotic factors influencing Silver Carp recruitment in the UMR. I completed my Bachelors of Science in Zoology from Michigan State University in 2017. During my undergrad, I was very active in conservation genetic research. Prior to my time at UWSP I focused on projects related to the spatial genetic structure of Burbot in Lake Michigan and the Manistee River and various types of genetic tools for Lake Surgeon research. My current graduate research is focused on conservation genomics and building the linkage map for cisco in the great lakes region. Upon graduating from UW-Milwaukee in 2016 with a B.S. in Biology, I worked with the US Geological Survey at the Lake Superior Biological Station where I was formally introduced to the process of fisheries management on the Great Lakes. I am excited to join the co-op research unit at UWSP, where I will be studying genetic variation within walleye from northern WI and MN waters in an attempt to improve stocking practices. My project involves a genetic analysis of five fish species above and below a dam on the Boardman River in Michigan. I will also perform eDNA analysis on water samples and compare that to estimates from traditional sampling methods. I received my B.S. in wildlife science with a minor in biology in 2014 from New Mexico State University. I have worked as a wildlife technician for New Mexico State University and as a fisheries technician for Colorado Parks and Wildlife, the Bureau of Land Management, and New Mexico State University. My research at the University of Wisconsin-Stevens Point will focus on otolith and fin ray microchemistry to identify natal origin of lake sturgeon in the Lake Winnebago system. In 2015, I earned my B.S. 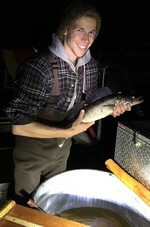 degree in fisheries and water resources from the University of Wisconsin-Stevens Point. Since graduation, I have spent the last two years working with the WI DNR as a fisheries technician in Sturgeon Bay. My graduate project will examine the diet compositions and predator-prey interactions among walleye, lake whitefish and yellow perch in Green Bay. I completed my undergrad at the University of Wisconsin-Platteville in 2016 earning a B.S. in biology with an ecology emphasis. Shortly after, I accepted a fisheries technician position with the Wisconsin DNR on the Winnebago system. My research interest and current graduate work is examining multiple methodologies for estimating age in lake sturgeon. Originally from California, I earned a BS in Biology from California State University, Long Beach in 2014. 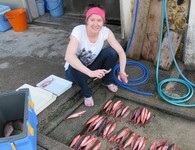 As an undergraduate, I volunteered for the CSULB Shark Lab as well as the Downeast Salmon Federation. 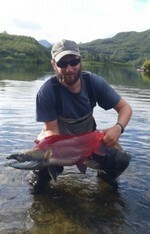 After graduating, I worked as a fisheries technician in Alaska, Idaho, and Oklahoma. In fulfillment of my MS in Natural Resources (emphasis in Fisheries), I will complete a project on the spawning movements and habitat selection of muskellunge in Green Bay, Lake Michigan.